Here at Damart, we love a little bit of exercise when we have the time, and quite often, we’ll enjoy it without even leaving the home. There are a great many benefits for exercising if you’re over 50, as research has found that moderate exercise just a few times during the week can provide an array of mental and physical benefits. In our store we have a great range of ladies sportswear to help you along, including thermal leggings and memory foam trainers, so with this in mind, what are the best light exercises for the living room? Sit ups are great for the body, and besides working out your abdominal muscles, sit ups also help strengthen core and stabilising muscles, which happen to be the ones that protect the spine from injury. For those looking for a greater range of flexibility and motion, sit ups are certainly exercises that you want to consider. You can also look for a little bit of a challenge by trying them on a medicine ball or with a little weight against your chest while performing them. Superb for building lower body strength, squats help release growth hormones, which are imperative for maintaining and increasing muscle mass. What’s more, these muscles are the ones that help regulate glucose in your body, alongside lipid metabolism and insulin sensitivity. These are important in preventing diseases like obesity, diabetes, and a range of cardiovascular issues. An exercise that focuses less on muscle, jumping jacks are great for the heart, and helps to stimulate its muscles as well as other bodily organs, including the lungs, which are made to work harder to get oxygen around the body. For those who are looking to exercise to alleviate stress, jumping jacks help to release serotonin, which are otherwise known as the “feel good” hormone. This chemical not only makes you happier, but will also reduce stress levels in your body. Press ups, or push ups as they are also known, are great for exercising the top half of your body without twisting or moving the spine. Although they can be a little bit harder to begin with, press ups help strengthen the forearms, biceps, triceps, and pectoral muscles, especially in women. Unlike other exercises, press ups can be performed in various styles, which is a great help if you’re just starting out. Wall push ups for instance, are great for beginners and they involve performing standing (or vertical) press ups, and are perfect for beginners. Once you have built a little strength, you can try knee press ups before moving onto full push ups. No matter what exercise that you decide to take part in, a five-minute stretching routine both before and after your exercise is a great way to loosen up the body. 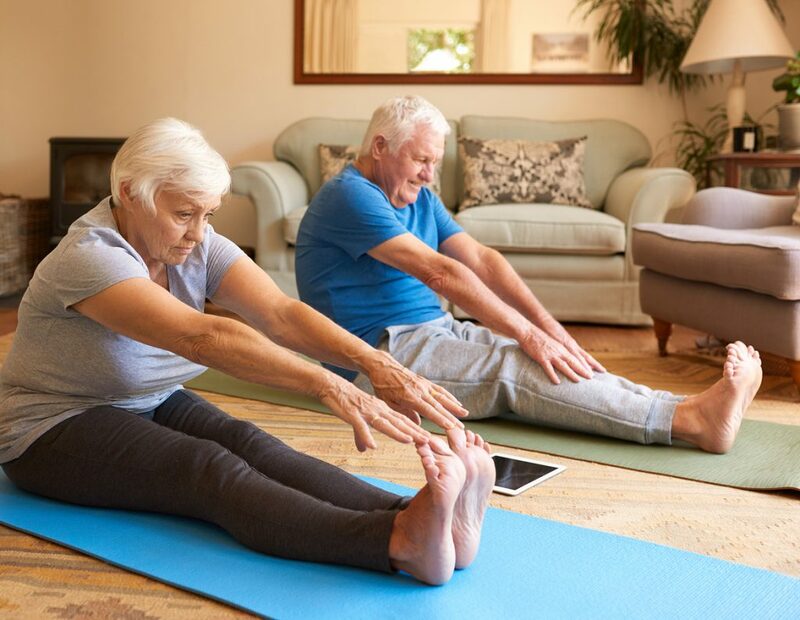 If you want to know a little bit more about stretching, this article by the NHS is great for explaining how to get the best out of a stretching routine.